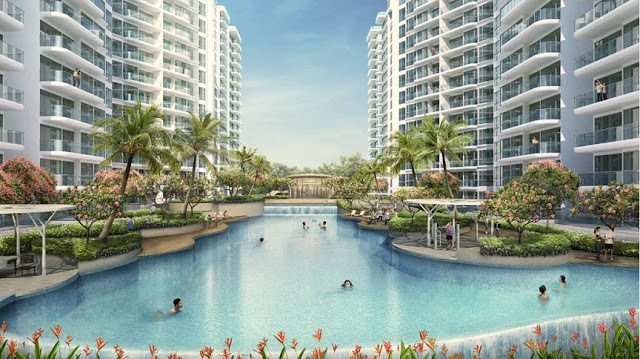 Riversound Residence is 99 years leasehold luxurious executive condominium located in the northeastern part of Singapore. 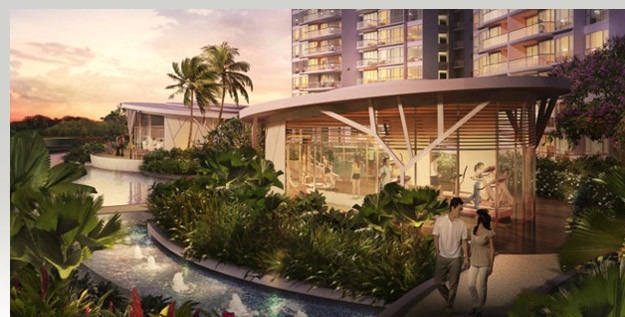 This world class condominium is located at 11 Rivervale Link Singapore 545081 in District 19. 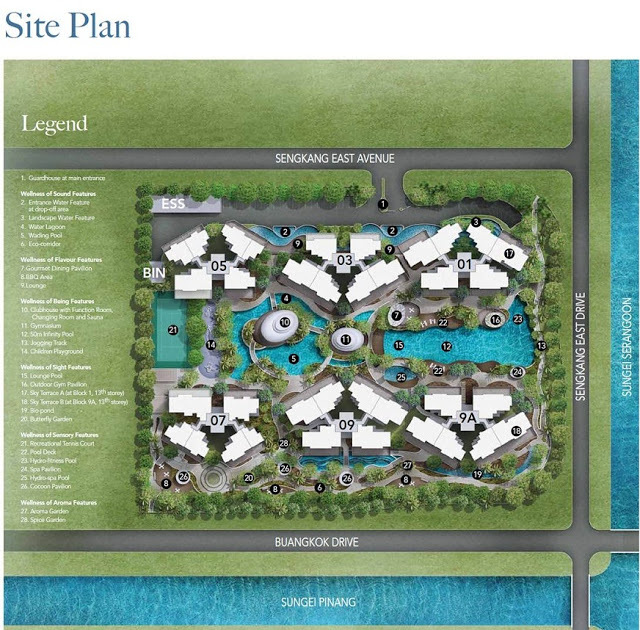 This beautifully designed architecture is expected to be completed in 2015 by the reputable Qingjian Realty Pte Ltd. The expected TOP is 31 Dec 2015. The total site area is about 21,0427.5 sqft. 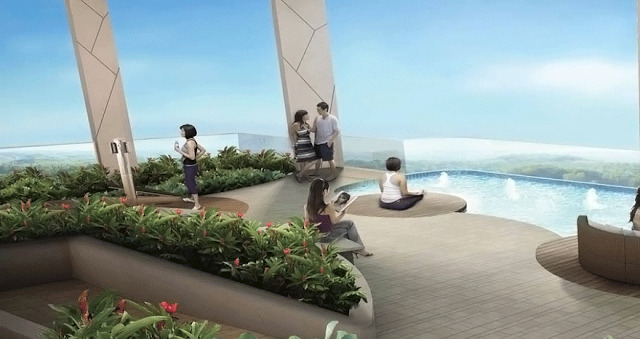 This elegant condominium has 6 blocks of 18-storeys with a total of 590 spacious units. The units comprise of 1 bedroom, 2 bedroom, 3 bedrooms compact, 3 bedrooms + utility, 3 bedroom dual keys, 4 bedrooms compact, 4 bedrooms + utility, 4 bedrooms dual key and 4 bedrooms penthouses. Nothing spells elegance like Riversound Residence. Lull your soul and calm your mind here. Experience a new level of indulgences here with many of its fabulous facilities for you to recharge, rejuvenate and refresh you mind, body and soul. Here you can ease away the tiredness accumulated and seek inner serenity. Over here, you and your family can enjoy the wide range of amenities. There are few wellness themed areas filled with facilities here. The Wellness of Sound consists of water lagoon, wading pool and landscape water feature. The Wellness of Flavor consists of a BBQ area, Gourmet dining pavilion and a lounge at level one. The Wellness of Being consist of a clubhouse with a function room, sauna and changing room, gymnasium, 50 m pool, children playground and a jogging track. The Wellness of Sight consists of unique sky gardens, outdoor gym pavilion, lounge pool, bio pond and a butterfly garden. The Wellness of Sensory consists of hydro-spa, spa pavilion, hydro-fitness pool, pool deck, cocoon pavilion and a tennis court. The Wellness of Aroma consists of a spice garden and an aroma garden. The myriad of in house facilities exclusively created for residents will pamper you to the max. In a class of its own, Riversound Residence, it is favorably located within the proximity of major roads and public transport. The nearest Mrt station is Buangkok Mrt station which is 0.5 km away. It is also located near to Sengkang and Punggol Mrt stations. There are several bus services available here. Driving to Central Business District or Orchard Road will only take you about 20 minutes. Major expressways like TPE and PIE are seamlessly and conveniently connected to every part of Singapore making it so hassle free for you to travel to work or play. 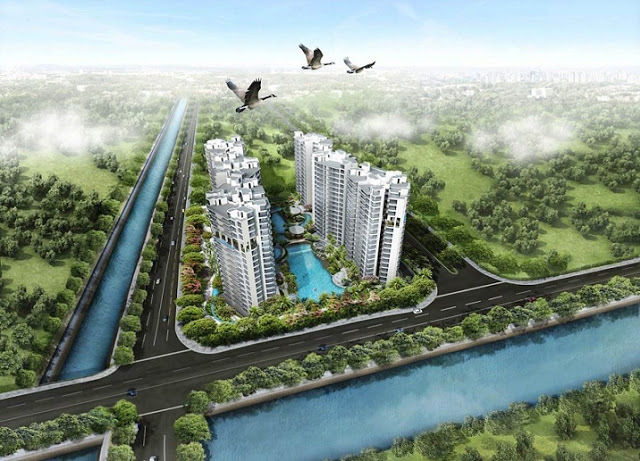 Riversound Residence is in the heart of Punggol and Sengkang new town. Residents here can head down to nearby malls such Rivervale Plaza, Rivervale Mall, Hougang Mall, Compass Point and Punggol Plaza to shop, fine dining, catch a movie, banking and grocery shopping. To enjoy more local delicacies, you can head down to the famous seafood restaurants at Punggol point or eateries in Sengkang and Pasir Ris. The nearest supermarkets are Cold Storage at Compass Point, NTUC Fairprice at 211 Punggol Road, Sheng Siong Supermarket at 301 Punggol Central and Prime Supermarket at 263 Compassvale Street. Other recreational facilities include Punggol Promenade, Punggol Waterway Park, Punggol Point, Marina Country Club, Sengkang Riverside Park, Sengkang Community Hub, Sengkang Sports and Recreational Centre. The primary educational institutions around include North Vista Primary School, Punggol Primary School, North Spring Primary School, Sengkang Primary School, Rivervale Primary School and Compassvale Primary School. The Secondary Schools in the neighborhood include Punggol Secondary School, North Vista Secondary School, Compassvale Secondary School, Serangoon Secondary School, Mee Toh School and Sengkang Secondary School. Riversound Residence is a prestigious home of timeless appeal for the privileged few where you can luxuriate in the lyrical moments of life. It is a highly sought oasis with architectural bliss within the picturesque beauty of lush natural environment. Take a retreat in the sensory abode with all your favorite indulgences in close proximity. Living here in this urban sanctuary reflects the ultimate dream that make any other possession secondary. It is definitely a true work, play and live nature retreat after a long day at work. Here, you can live your life according to your own rules. Right here, you can find equilibrium and tranquility and get fully recharged for new challenges ahead. It is indeed a perfect dream home for everyone.